You have the ability to view whom you have and haven't registered with USA Swimming for a given year. First, add the column to show what year each swimmer is registered. In the side menu click Team Admin > Account/Member Admin. 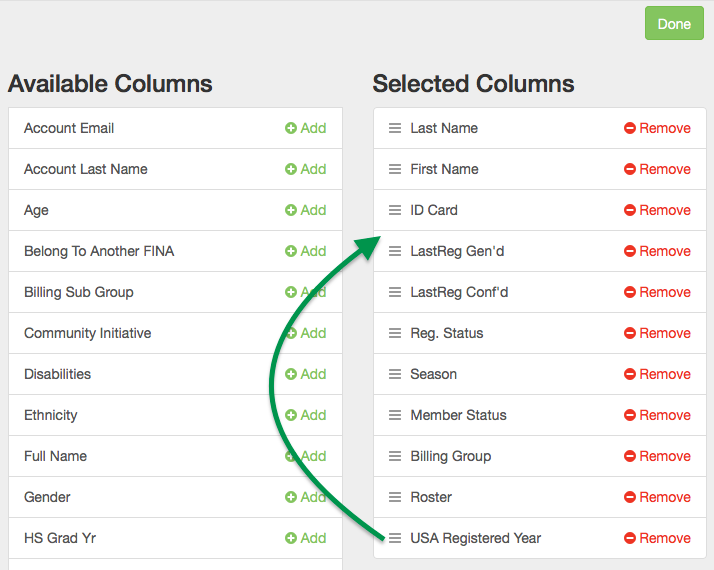 Scroll down and click + Add by USA Registered Year to add it to the Selected Columns on the right. Drag USA Registered Year higher up in the list if desired. Now let's display who has NOT registered with USA Swimming throughout the year so you can register them in the next batch. Click Not Yet Registered on the left, and click Not Registered 2017 on the right (or whatever year is needed). Note there is a Year Registered filter if you want to display only those swimmers you have registered for a certain year instead. As a best practice, we encourage you to save this view so you can instantly pull it up throughout the year to see who needs to be registered with USA Swimming in the next batch. In the Save View field on the right, type in a name for this view, such as 2017 Not USA Reg and click Save View. To bring up the view later, click Saved Views, then click 2017 Not USA Reg (or whatever you called it) under Your Saved Views.